In 2010, I was a Web Designer working on the Club Penguin website. Club Penguin is a virtual game for children (massive multiplayer online role playing game also known as MMORPG). The website was a gateway to the virtual game, where children of ages 6-12 play online games, earn virtual coins and purchase virtual items. The game environment, lovable characters and stories were a large part of the magical experience. 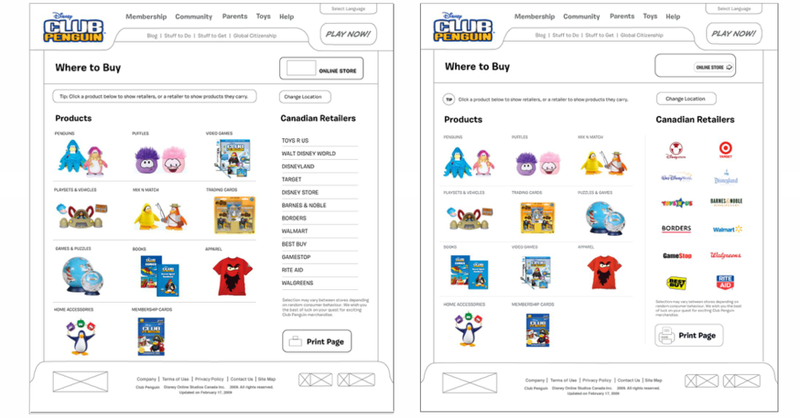 Design an interactive web experience that makes finding Club Penguin merchandize and toys at physical stores extremely easy, fun for children, parents and grandparents who buy these adorable things for little ones.